The Sunshine Apartment 21 is located in the first Floor of the house in the beach park Großenbrode sunshine. The house was completed in 2011. The apartment has everything your heart desires equipped with everything. The kitchen is fully equipped, a nice bright living room with fireplace, TV-Relax armchair and a balcony. A spa with sauna and spa shower round out the luxury of this apartment. The beach is only about 80 meters. Here you can laze in the summer, enjoy in a beach chair, or take long walks on the beach in winter. Enjoy anytime the sound of the sea, the Baltic Sea breeze and the ambience of our apartment. The apartment is on the 1st Floor. The balcony faces south-west. 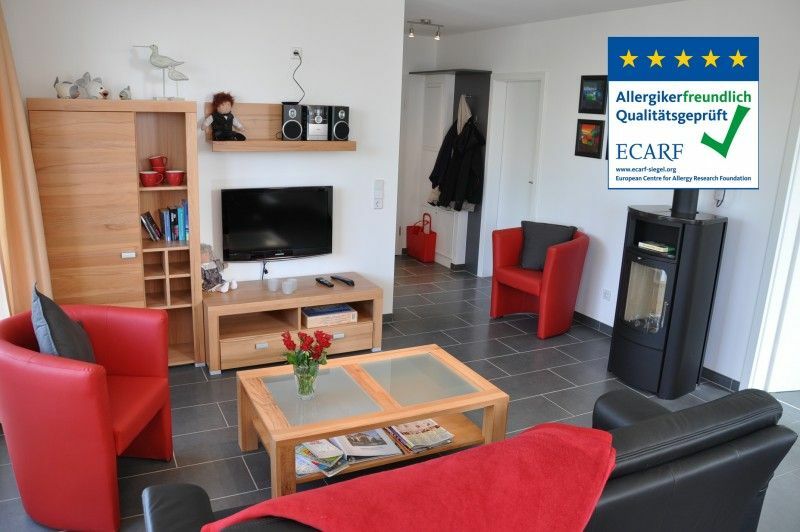 This holiday home has been certified by the ECARF as allergy-friendly. We offer smoke and pet-free accommodation with carpet-free floors or short-pile floor coverings. We offer protective covers for mattresses, duvets and pillows for mite reduction. Our vacuum cleaner has a special filter. There is also a secure bicycle shed (150x300 cm) and a cart for the walk to the beach. The bathroom has a spa shower. For optimum enjoyment of coffee is available in addition to a filter coffee machine nor a Tassimo coffee machine available. Lift is available in the house. From May to September is available free a beach chair available. In addition to our apartment includes a lockable bicycle shed (150x300 cm). Wir hatten super tolle Tage in der tollen Ferienwohnung Sonnenschein 21. Die Wohnung ist gemütlich eingerichtet, sauber und es fehlt einem an nichts. Wir haben im Mai 2012 einige Tage in dieser absolut schönen Fereinwohnung verbracht. Die Wohnung ist noch viel schöner als aus den Bildern ersichtlich. Viele kleine Details sorgen für Gemütlichkeit, Komfort und Wohlbefinden. Das Wetter war so toll, dass wir viele schöne Radtouren gemacht haben und aus Zeitgründen nur einmal die Sauna nutzen konnten. Sehr angenehm empfanden wir, dass ein eigener Strandkorb kostenlos zur Verfügung stand. Die Wohnung ist sehr ruhig und von Baulärm in dieser Wohnung keine Spur. Grossenbrode ist für einen ruhigen, entspannten Urlaub eine gute Adresse. Wir kommen bestimmt in absehbarer Zeit wieder. Numerous activities in the sea-embraced spa resort Großenbrode promise you an incomparably relaxing holiday. Either spend a fantastic day at the nearby sandy beach with a beautiful promenade, where you will find numerous cafes, restaurants and shopping facilities, participate in soothing spa and relaxation facilities in the spa center, engage in sports, by sharing the maritime passion and to Try countless water sports ranging from swapping to deep-sea fishing to sailing or you can visit one of our six marinas, which are idyllically situated on the Großenbroder Binnensee lake. The excellent location of Großenbrode offers the opportunity to visit the sunny island of Fehmarn via the imposing Fehmarnsund Bridge. There you can visit the marine center with an unbelievable selection of water dwellers or continue with a car / train ferry from Puttgarden to the Danish Rødby. Fun for all ages can also be found in Hansapark, where you can spend a whole day doing fast maneuvers and entertaining shows. The Hanseatic city of Lübeck guarantees a historical experience with its important Holstentor, which protected against intruders in the late Middle Ages. Take a leisurely boat trip on the Trave and enjoy the Hanseatic city with typical Lübeck marzipan.